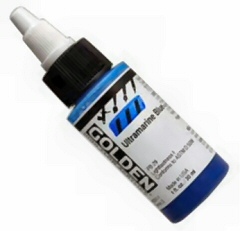 Artist Quality Acrylic Paints including Golden, Holbein and Atelier Interactive. Primacryl is a premium acrylic colour using modern pigments in exceptionally high concentration. Primacryl gives colours a new dimension of brilliance and expressiveness. Of note, the titanium white is unparalleled in opacity and coverage giving incredibly brilliant mixtures. All colours in the range are rated four or five stars for lightfastness ensuring the quality expected of Schmincke paints. Golden High Flow Acrylics are a very versitile ink like acrylic paint. You can use them with brushes, pens, refillable markers and airbrushes, or just pour straight from the bottle. Many effects can be achieved from fine to broad strokes, staining, colour levelling, glazing, inking, lettering and traditional calligraphy. Holbein palettes are very good quality. 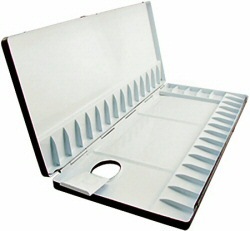 The special covers both the watercolour and multi-purpose palettes. Acrylic paints are 'of our age'. They have opened up many new possibilities for artists. We have chosen our range with this in mind. Golden Acrylics are not only exceptional paints but they also come with an amazing array of gels, pastes and mediums. Exploring should be mandatory. High Flow - very thin, ink like. Fluid - consistency of cream. Heavy Body - traditional, buttery. A premium quality acrylic with intense colour. Extremely lightfast. Imparts brilliant mixes. Available in Heavy Body, Fluid and Liquid consistencies. 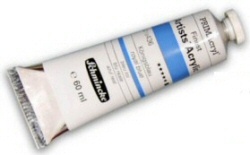 A fine range of mediums and effect gels and pastes are also available.